The following article was published on 11/07/2004 and discusses a variation of the VHS VCR format that was available briefly but has been discontinued. The information has been preserved, with updated context for historical reference. In 2004, HDTV (High Definition Television) was in the news, with controversy over how it would fit into the future of TV viewing. For HDTV to be successful, in addition to HDTV broadcasting, other viewing platforms needed to be compatible with high definition video formats. While DVD dominated home movie viewing and looked good to most consumers, it was not a high definition format. In addition, recordable DVD did not support high definition either. 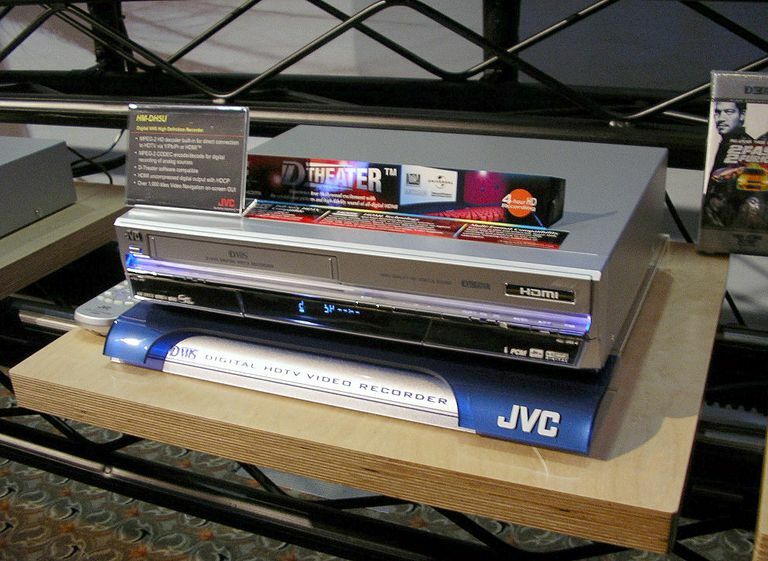 In 2004, high definition DVD recording and playback for consumer use was still in the prototype stage, being shown at tradeshows and other exhibits. With the lack of high definition alternatives beyond over-the-air broadcast and satellite programming, JVC and Mitsubishi introduced a high definition video recording and playback format that they felt, would fill the need, and the result in the quicker acceptance of HDTV. While the CE industry and the consuming public were putting all the attention on DVD, JVC and Mitsubishi had been quietly elevating VHS technology with the development of D-VHS. In brief, D-VHS VCRs were totally compatible with standard VHS, they had the ability to record and play all standard VHS and S-VHS formats, but with an added wrinkle: D-VHS is capable of recording in all 18 DTV approved HDTV broadcast formats, from 480p to full 1080i, with the addition of an external HDTV tuner. In addition, four movie studios (Artisan, Dreamworks SKG, 20th Century FOX, and Universal) had given support to produce high definition pre-recorded programming for D-VHS in a format dubbed D-Theater. Unlike DVD releases, movies released on the D-VHS D-theater format were in 1080i resolution, giving the HDTV owner access to alternative HD content. It was hoped that this could impact the HDTV market in that where many consumers that would like to access the benefits of HDTV but have difficulty accessing broadcast or satellite HD feeds. The only consideration was that Mitsubishi D-VHS VCRs did not support the anti-copy encoding used on D-Theater releases, but the JVC D-VHS VCRs did, so, if you wanted to access pre-recorded HD films on D-VHS, the JVC was your best option. Although D-VHS appeared to have a huge potential, there were hurdles. JVC and Mitsubishi did not resolve compatibility differences between their two products. Tapes recorded on the JVC in D-VHS could not be played on the Mitsubishi or vice-versa. In addition, it was reported that while the JVC could play back HD recordings on most any HDTV, the Mitsubishi unit was only HD playback compatible with Mitsubishi HDTVs or other branded HDTVs equipped with a firewire (iLink, IEEE-1394 input). 1. Backward compatibility with VHS. All D-VHS VCRs could play and record in the standard VHS format. 2. It's status as the only home recording format at the time that could record and playback in full HDTV resolutions. At the time of its introduction, there was no other high-definition recording or playback system capable physical format for consumers. To put the squeeze on D-VHS from the D-Theater playback perspective, Blu-ray and HD-DVD were finally introduced in 2006, but only players were introduced in the U.S. and not recorders. On the other hand, Blu-ray and HD-DVD recorders were made available and sold well in Japan. Also, since HD-DVD is now discontinued, Blu-ray is now the default high definition disc format. At this point, it is doubtful that Japan-based companies will market Blu-ray Disc recorders in the U.S. due to competition from TIVO and cable/satellite DVRs. Currently, in the U.S. the only way to record on Blu-ray on the consumer level is via a Blu-ray Disc writer installed or externally attached to a PC. Unfortunately, although Blu-ray and HD-DVD failed to produce recorders for the U.S. marketplace, the overall continued success of Blu-ray as a high-definition home theater viewing format, coupled with few added adopters of D-VHS, resulted in the demise of both D-VHS and D-Theater, while, ironically, standard VHS although officially discontinued in 2016, is still in use. Looking for Blu-ray Disc Recorder? - Good Luck! Can You Record HDTV programs on a DVD Recorder?